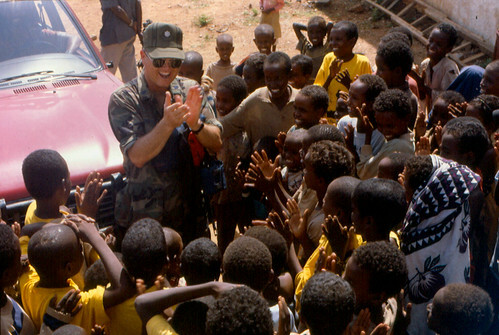 Lt. Col. Johnson of the 22nd ARW Public Affairs Office interacts with Somali children at an orphanage in Baidoa. He led them in the ABCs and counting, and they were enthralled. The children could hardly stop touching our hands, faces and hair. We must have looked pretty strange to them, but they were so curious and friendly.